Reaction Kinetics is part of a free web series, GWB Online Academy, by Aqueous Solutions LLC. (e.g., Lasaga, 1984). In this equation, AS is the surface area of the mineral, k+ is the intrinsic rate constant, and Q and K are the activity product and equilibrium constant for the dissolution reaction. By this equation, a mineral will precipitate when it is supersaturated and dissolve when it is undersaturated at a rate that depends on its rate constant, which you supply, and surface area. where r is the mineral’s dissolution rate, AS is the surface area of the mineral, k+ is the intrinsic rate constant, aj, mj are the activity or concentration of promoting or inhibiting species, Pj is a species’ power (+ is promoting, − is inhibiting), and Q and K are the activity product and equilibrium constant for the dissolution reaction. where R is the gas constant and TK is absolute temperature. 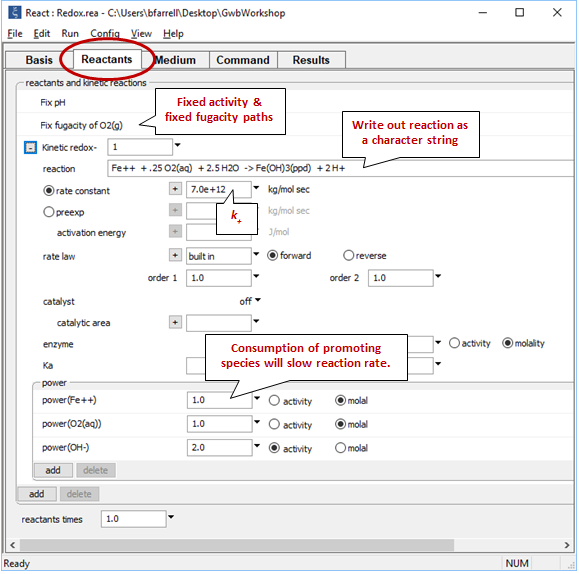 The Built-in Rate Law is sufficiently broad for most geochemistry applications, but the user can alternatively specify a custom rate law by writing an equation, BASIC script, or a compiled C++ function that the program can evaluate. Let’s calculate how quartz sand reacts at 25°C with deionized water. How long will it take for a solution to come into equilibrium with silica sand? The reaction is Quartz → SiO2(aq). According to Knauss and Wolery (1988), the above rate law is valid for neutral to acidic solutions; a distinct rate law applies in alkaline fluids, reflecting the dominance of a second reaction mechanism under conditions of high pH. 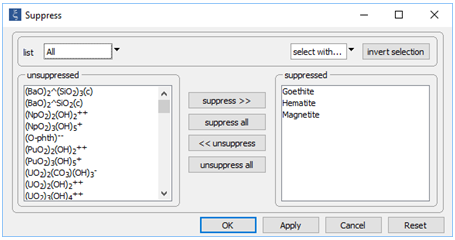 Here we’ve defined a dilute fluid, undersaturated with respect to quartz, and specified the time range of the calculation. The rate constant k+ is from Rimstidt and Barnes (1980), and the specific surface area Asp is from Leamnson et al. (1969). 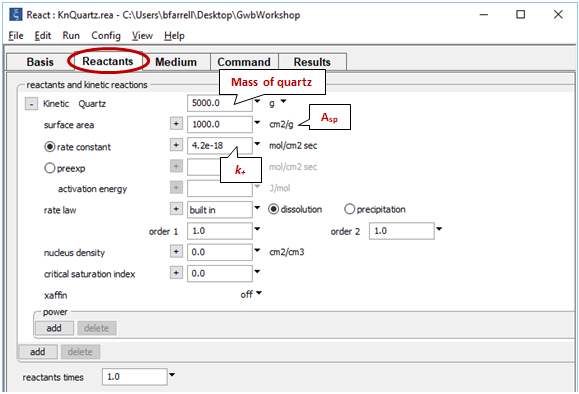 React calculates the surface area of a mineral from its mass and the specific surface area in cm2 g-1 that you supply. and select Run → Go. React will move to the Results pane and trace the simulation. In this way, we keep our discussion simple by preventing those minerals from forming. On Config → Output..., set a suffix “_oversaturated” and repeat the run. For each case, plot SiO2(aq) concentration and the fluid’s saturation state versus time. How long does it take for the silica concentration to stabilize? Does the fluid approach equilibrium with quartz? Are laboratory experiments at this temperature likely to achieve equilibrium? 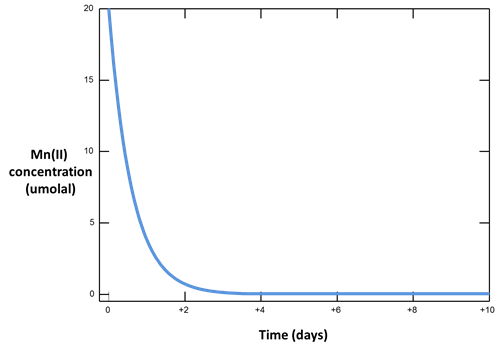 In the first simulation, the silica concentration gradually increases from the initial value, asymptotically approaching the equilibrium value of 6 mg kg-1 after about half a year of reaction. In the second case, the supersaturated fluid, silica concentration gradually decreases from its initial value. As in the previous calculation, the fluid approaches equilibrium with quartz after about half a year. At low temperature, many redox reactions are unlikely to achieve equilibrium. Lindberg and Runnells (1984) demonstrated the generality of this problem. They compiled more than 600 water analyses that provided at least two measures of oxidation state and calculated species distributions for each sample. They then computed redox potentials for the various redox couples in the analysis, using the Nernst equation. Their results showed that redox couples in a sample generally failed to achieve equilibrium with each other. 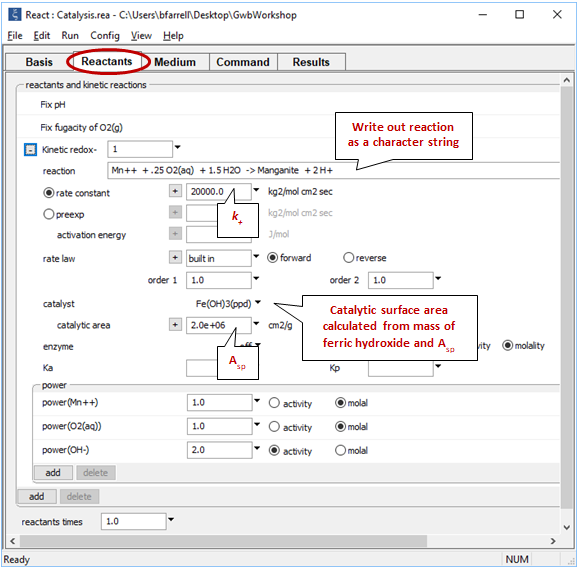 Before this idea was widely accepted, the common approach in geochemical modeling was to assume that all redox reactions reached equilibrium. 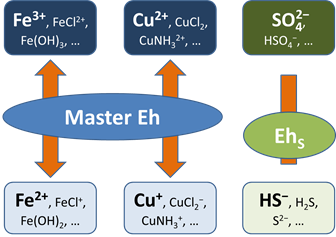 The user sets a single value for the system oxidation state, or a “Master Eh,” which controls the distribution of species among different oxidation states. A more realistic approach is to allow for redox disequilibrium by disabling one or more redox coupling reactions. 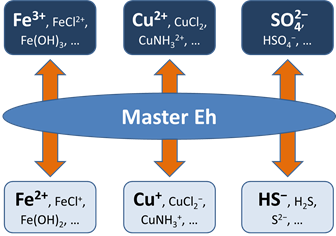 All coupled redox reactions still reflect the Master Eh for the system. Disabled redox couples, though, behave independently. 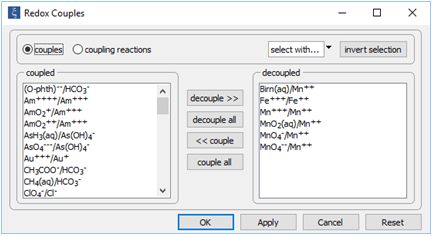 Any number of redox coupling reactions can be disabled. For any disabled pair, furthermore, a modeler can describe the rate at which mass in one oxidation state is transformed to another using a kinetic rate law. In this case, the ferrous iron ion, molecular oxygen, and the hydroxyl ion all promote the rate of the reaction. Because Fe2+ and O2(aq) are reactants, and because the reaction generates protons, the reaction will slow down as it moves forward. With kinetic rate laws you can trace the progress over time of redox reactions as they move toward equilibrium. 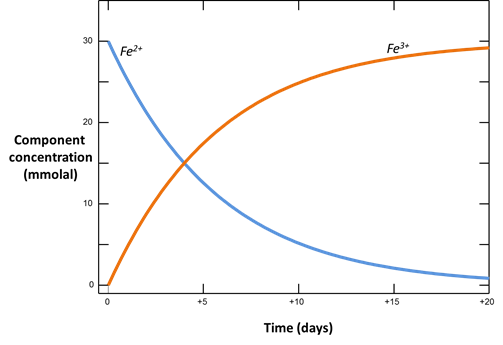 The following procedure models the oxidation of ferrous iron by molecular oxygen, assuming that the reaction produces ferric hydroxide. Here, the reaction between ferrous and ferric iron has been disabled. Iron in the simulation can therefore change redox state only by kinetic reaction. shows the fluid’s initial composition. 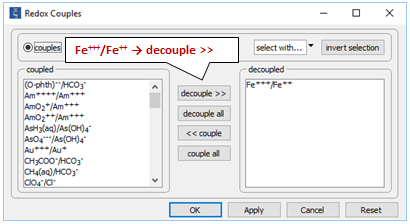 The ferrous and ferric components are constrained separately, since we’ve decoupled the Fe+++/Fe++ redox pair. 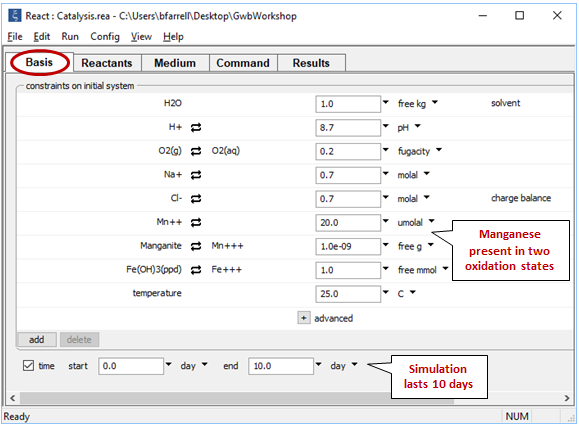 The “fix pH” and “fix fugacity of O2(g)” options simulate reaction in a pH-buffered laboratory experiment left open to oxygen in the atmosphere. Click on the button next to reactant “redox-1” to expand its entry. 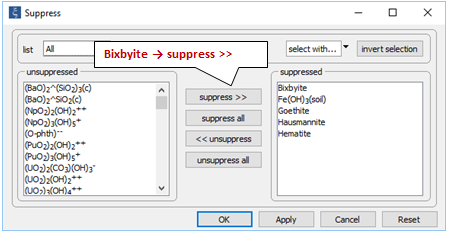 The reaction by which the ferrous iron component oxidizes has been written out explicitly as a character string that the program will read and interpret. If the kinetic reaction hadn’t already been created, you would click here on add → Kinetic redox to do so. Select Run → Go to calculate the model. Plot how the Fe+++ and Fe++ components in the system vary with time. According to the form of the rate law, what is the order of the rate law? In our buffered system, what is the apparent order? In our buffered system, the Fe2+ ion is the only promoting species whose concentration changes. Because it is set to a power of 1 in our rate law, the apparent order of the rate law is 1. As a result, the reaction rate is directly proportional to the concentration of the Fe2+ ion. As its concentration in solution decreases, the rate of the reaction slows. where AS is the catalyzing surface area. You can choose a specific mineral as a catalyst (AS will be calculated from its mass), or set a total area. It is also possible to set parallel pathways for same redox reaction (i.e., the absence or presence of a catalyst). The total reaction rate would then be the sum of the rates. Let's look at how mineral surfaces can promote redox reactions. Note how we’ve disabled reaction between ferrous and ferric iron, as well as the reactions between several oxidation states of manganese. 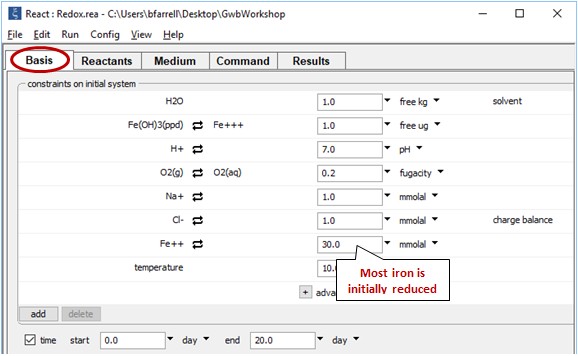 Iron and manganese in the simulation can change redox state only by kinetic reaction. Click on File → View → .\thermo_ladder.tdat. This dataset is the “thermo.tdat” compilation we’ve been using, modified to allow decoupling of the Mn(III) and Mn(IV) redox states. 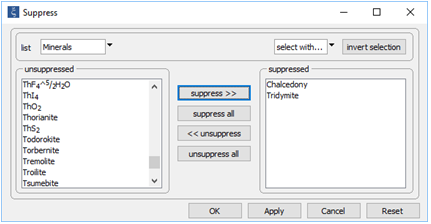 Among other changes, the Mn+++ redox species has been imported from “thermo.com.v8.r6+.tdat”, and reactions for Mn(III) bearing minerals have been rebalanced in terms of the new redox species. We consider a system containing reduced and oxidized manganese, as well as ferric hydroxide, which provides the catalyzing surface for manganese oxidation. The oxidation of Mn++ to manganite (MnOOH) by molecular oxygen is catalyzed on the surface of ferric hydroxide. 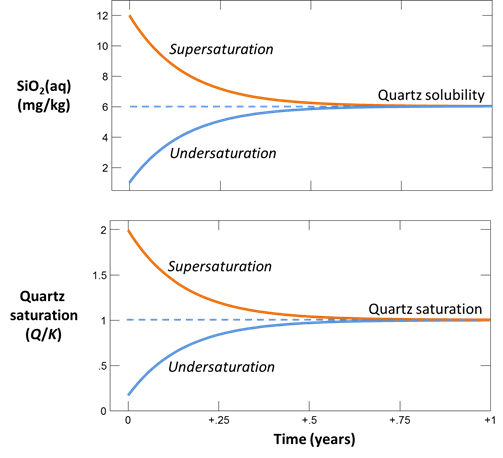 note the various iron and manganese minerals have been suppressed because they are stable, but unlikely to form over the time span of the simulation. Note under Config → Output… the suffix "_catalysis"
Select Run → Go to trace the simulation. Plot versus time the concentration of the Mn++ component. How does it change, and why? Knauss, K.G. and T.J. Wolery, 1988, The dissolution kinetics of quartz as a function of pH and time at 70 °C. Geochimica et Cosmochimica Acta 52, 43–53. Lasaga, A.C., 1984, Chemical kinetics of water-rock interactions. Journal of Geophysical Research 89, 4009–4025. Leamnson, R.N., J. Thomas, Jr. and H.P. Ehrlinger, III, 1969, A study of the surface areas of particulate microcrystalline silica and silica sand. Illinois State Geological Survey Circular 444, 12. Lindberg, R.D. and D.D. 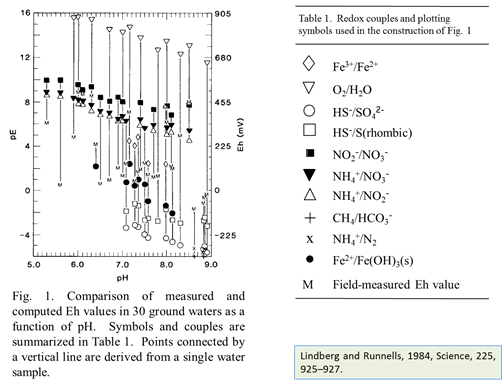 Runnels, 1984, Groundwater redox reactions: an analysis of equilibrium state applied to Eh measurements and geochemical modeling. Science 225, 925–927. Rimstidt, J.D. and H.L. Barnes, 1980, The kinetics of silica-water reactions. Geochimica et Cosmochimica Acta 44, 1683–1700. Move on to the next topic, Acid Drainage and Buffering, or return to the GWB Online Academy home.